This week has been pretty chaotic and will be remembered by most New Yorkers more as "Sandy Week" than "Halloween Week". That's right, Halloween was this week but we kind of all forgot about it because of Sandy. The hurricane hit New York on Monday night and the city is still slowly recovering from it, as the West Village, East Village and Downtown are still without power. 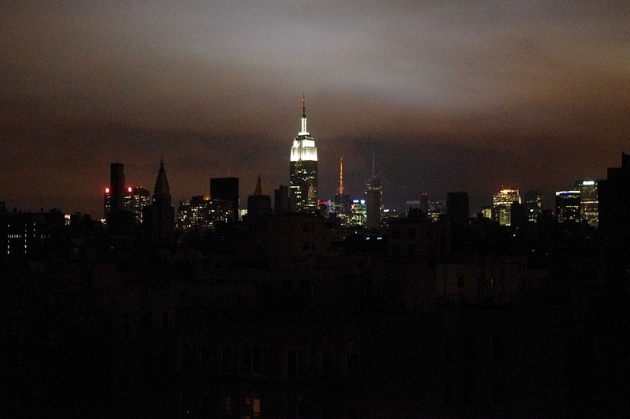 Lower manhattan without power. Photo credit: Wikimedia, David Shankbone. So my week started by 2 days away from the office, but still Facebooking and Tweeting from my laptop, and following the city's efforts to get back to a normal life. Once again, I was reminded that social media is an exceptional tool to share and collect information, connect with friends, relatives and strangers, document events and show some solidarity. More on that on my other blog earlier this week. So besides Sandy, this week I try not to forget that Halloween was still celebrated in the country and around the world by posting some scary and spooky Film Annex movies on our Facebook page. If you missed it, the week isn't over, so go watch Attack of the Giant Vegetable Monsters, Kuragannon, and Clay Jack Nicholson is Crazy. I also took some time to go over some of our channels to make sure we always offer the best content. Speaking of content, this week we welcome MadLabProductions with their animated short films Rise of the Living Corpse and Fitness Class Zombie, which are right into the Halloween and zombie theme. We hope we get to see more from them soon. You also get two Abbot and Costello classics and some news from ECU traveling to China. This week, I tried to start focusing more our LinkedIn company page to reach out to people and spread the word about our platform and the Afghan Development Project. LinkedIn is THE platform to go to build a professional profile. The website counts more than 187 million members in over 200 countries and territories. Two new members register every second! And we are one of the 2.6 million companies that have a LinkedIn company page. This is a lot of people to possibly connect and do business with! Some contacts about Afghanistan are started to get established and will hopefully lead to something concrete! Back to Sandy, I finish my week by spreading the word about our Sandy documentary. We are calling all filmmakers, writers or just viewers to share with us their videos filmed before, during and after the hurricane. The footage we receive will be turned into a documentary, then distributed on Film Annex. The bonus: All the revenues generated by this documentary will be donated to the victims of the Hurricane. So we create a documentary that informs AND helps! That's all for this week. Is it too early to start thinking of some Thanksgiving movies? PS: Bon Anniversaire again to Tommy of Models Web TV and good luck with the new ping pong racket!